We often get called to homes where the owners are about to rip out their carpet due to how stained and dirty it is. If this is you, STOP! 9 times out of 10 we can restore your carpet and keep you from the major expense and hassle of replacement. Just this week we were called to a family cottage where the owner had spilled a whole bottle of bright red fingernail polish the night before. And of course, the carpet was white! We arrived within 24 hours of the spill but the polish had dried and set. As you can see from the pictures below, it was a mess! And to top it off, they were expecting family the following day. We got to work and three hours later you could barely tell there had been a spill at all. So if you have an accident or spill, don't send perfectly good carpet to the landfill, give us a call and let us clean things up for you. Over the years Pristine Floor Care has tackled a number of different challenges when it comes to carpet cleaning in Traverse City. Whether it's getting the up north cottage ready for Summer, spring cleaning in your home, or cleaning the carpets as you move in or out of a new place, we have done it all! We have dealt with spots and stains ranging from pet accidents, to kids spills, wine stains, or even stains that no one knows about (or wants to confess to). One of the things that really sets our style of carpet cleaning a part from the rest is the machine we use. First, we use a truck mounted carpet cleaning machine. A machine that is permanently mounted in a truck will always be more powerful than a portable one that gets brought inside your home. Why? Well, it's mounted in the truck for a reason... it's size! And when it comes to carpet cleaning, the size and weight of a machine has a direct correlation to the heat and extraction power that a company can use to clean your carpets with. A second thing that sets Pristine Floor Care apart is our method of cleaning. We pre-spray your carpets before we clean them. If you do the laundry in your home you know that pre-treating stains is the best way to remove them. Cleaning your carpet is no different. Some companies are mostly concerned with how quickly they can get in and out of your home and on to the next job. In order to speed up the process they send their cleaning solution through their system and it is sprayed onto the carpet mere milliseconds before it is extracted! The cleaning solution just doesn't have time to do it's job. We spray our cleaning solution onto your carpet first and allow it time to dwell before we come back to steam clean it. We find that this is so important when removing the stains, spots, and overall grime that carpets take on from years of use. Yet another thing that we find enables us to provide better carpet cleaning than our competitors is the water we use. We bring our own water to ensure we are using the best water for our steam cleaning. We use expensive filters and softeners to prepare the water we bring to your house. Some cleaners are using water straight from a well. Well water contains many hard water minerals that restrict the free clean rinse that our filtered water provides. Other cleaners use city water which might have less minerals than well water, but also contains chlorine which can break down and fade carpeting over time. 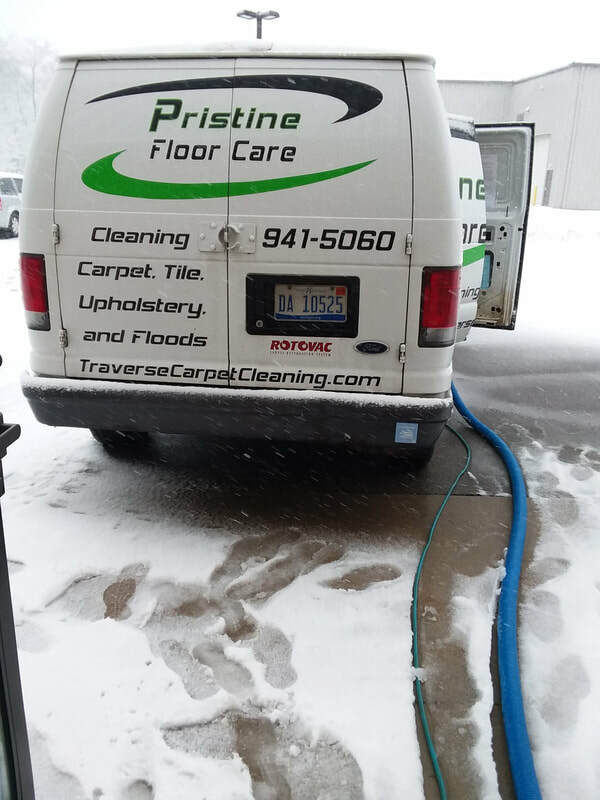 When it comes to getting clean carpet in Traverse City the professional carpet cleaners at Pristine Floor Care take the time and make the investment to make sure they are getting your carpet clean so you can enjoy your home without wondering if you really got your money's worth from a low price discount carpet cleaner. One of the top reasons that people call a carpet cleaner is because they have a stain, spill, or pet accident on their carpeting. Often times people tell me that they have tried different products to treat the area but the stain simply won't go away. The biggest reason that these grocery store products fail is that they can only mask the stain. Think about it, does spraying a bottle of carpet cleaner on a spot actually remove the spot? No. I liken this to someone with a stain on their shirt. Sure, you can spray something on the spot, but what if that was all you did? Would the shirt be clean? Of course not! After you treat the stain you throw the shirt in the laundry where the washing machine will extract the original staining material. This is the same idea with your carpet. Treating the carpet with an appropriate product is part of the solution, but then you must have the ability to flush and extract the stain away. This is even more important with pet accidents. The last thing you want to do if your dog or cat has had an accident on your carpet is to spray it and let it be. It might mask the odor for a bit but the "mess" is still in your carpet. Again, what if a toddler had an accident in his pants? You would never think of simply spraying the pants and then allowing them to be worn again! This is why it is so important to call a professional carpet cleaner who has the equipment to flush and extract the accident from your carpet. But how do you know if the person you're calling has the right equipment to do this? It takes a powerful machine to extract everything out of the carpet fibers. One of the most important questions you should be asking is whether or not the carpet cleaner has a truck mounted machine, or a portable cleaner. A truck mount is heavy duty and is permanently mounted in a truck or van. A portable unit is light weight and, well, portable. A truck mount runs on gas, a portable off of your homes electricity. It would be the difference between using a gas powered Toro snow blower vs a Black and Decker with an electric cord. If you want your driveway cleared, you'd choose the Toro! And if you want your carpets clean choose someone (like Pristine Floor Care) who operates a truck mounted carpet cleaning machine.